I tend to have that Pavlovian response when one of my favorite artists/groups releases a new record (CD for the younger generation). It’s that panting, begging, can-I-have-it-now, hurry, how-about-now, can-I-please-have-it-now type of reaction. I suppose it’s the same reaction an addict would have when going too long between doses of their drug of choice. Fortunately, my drug of choice is music, which unlike other additions, has a positive lasting effect on the body as well as refreshment for the soul. 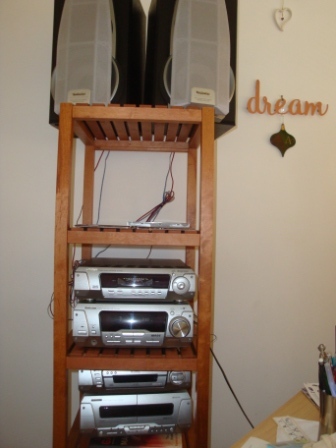 I’d begun to realize over the last few months, that I really missed having a stereo – especially one with a CD changer where I could load up some of my favorite CDs, hit play, and let the music wash over me, cleansing my heart and soul. The two years here in Ireland is the longest I’ve gone without a stereo since I bought my first one in my teens (nearly too long ago to recall). Not that I was without music that long – I would surely have perished by now, but the sound from my laptop isn’t the greatest, nor can I tolerate the headphones from my MP3 player for any length of time. Radio is too full of chatter and too lacking in long periods of consistent music (most of the stations I can get on my clock radios are all over the map with their music selection – a country tune followed by a rap which precedes rock then something from the 40’s). I need a consistent genre with little or no interruption. Hi-Fi stereos have been replaced these days by what are essentially amplifiers for MP3s which isn’t the best format for showcasing subtleties in music. Therefore, although I’ve been looking for a stereo with a CD changer, they just don’t seem to be readily available. 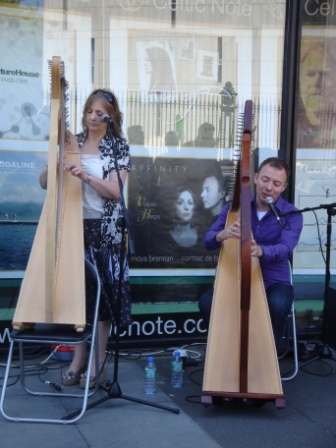 It was about the same time that I found a stereo with a CD changer on one of Ireland’s online versions of a swap meet (adverts.ie) that I also received the email that Moya Brennan and Cormac de Barra were releasing a new Voices and Harps CD called Affinity. I nearly leapt for joy at having a new toy and a new CD to play on it. 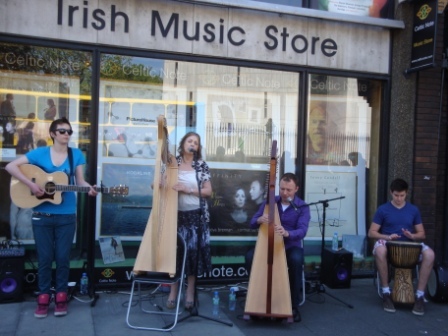 As if that wasn’t good enough, they were also giving a free mini-concert at Celtic Note in Dublin to launch the new collection. Joined by Moya’s daughter Aisling on guitar and a young man named Paul on drums, they played about half a dozen songs before taking a break to allow the crowd that had gathered to purchase CDs which they offered to sign. I stood behind a couple who must have brought their entire Clannad collection to be signed (along with 3 of the new CDs and several 8 x 10 photographs). Whilst I’m sure artists are grateful to have devoted fans, I think people should show a bit more respect and restraint. To Moya’s credit, she signed them all graciously. Cormac stood not far away, chatting with patrons and kindly adding his sentiments and signature with a genuine smile. The new CD, which is playing as I write, is a composition of tunes similar to those on the first Voices and Harps CD – lullabies to toe-tapping Irish-lyric tunes, plus a few of the ethereal type songs that grace Moya’s earlier solo works. Each of the dozen tracks is joy to the eardrums and beyond. What I noticed as I walked away was that there was not only a smile on my face, a smile in my heart, but my soul was shining brighter than it had been in a while. Music does that to a person. So I think I’ll just sit a spell as the machine cycles through the CDs I loaded and let my soul soar.